Stage 4 lymphoma, three lung infections, on a respirator. It wasn’t looking good for Dad. The day had come—we planned to take Dad off the respirator at noon; two doctors said he wasn’t coming back. 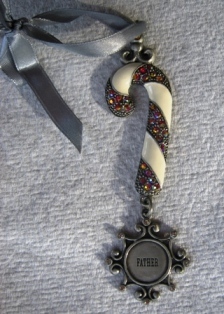 That morning in the hospital gift shop, I bought a Christmas ornament that said, “Father.” I knew I’d be remembering him this Christmas and every year as I decorated my tree. 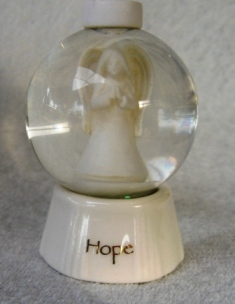 I also was drawn to a little snow globe with an “Angel of Hope” inside; I couldn’t resist, so I bought that, too. Oddly, all hope seemed to be lost. Family members arrived at the hospital early; we sang Dad’s favorite songs, then took turns holding his hand as we said our silent goodbyes. His hand was warm, but I felt his life slipping away; the tears wouldn’t stop flowing. It was never a day we anticipated or would wish for anyone. We watched as fourteen tubes were disconnected one by one. At noon, the respirator would be the last. This entry was posted in Uncategorized and tagged angel of hope, cancer, Cathy W. Lauro, end of life, faith, father, heart warming, hope, miracle, spiritual journey, The Inside Advantage. Bookmark the permalink.